Главная / Products to bring from Krasnoyarsk: TOP 6 – the best ideas! Siberia is a unique, rich and giving region. There are a lot of things to see, to taste and to bring home as a delicious present or a souvenir. 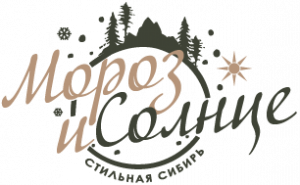 Citizens and guests of Krasnoyarsk, welcome to our shop! You can find the most original presents and souvenirs here. We offer you the most popular and interesting gifts that will surprise your relatives and friends. 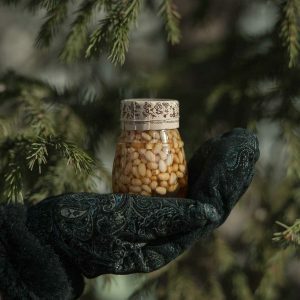 Pine nut kernel is one of the most popular Siberian souvenirs, and it makes sense as the Siberian pine is grown only here. These nuts are not only delicious but also very healthy. They contain amino acids, vitamins, minerals and vegetable protein, 99% of which is absorbed. Regular consumption of the kernels is beneficial to heart, vessels, leaver, immune and nervous system. There are both whole and shelled cedar nuts in different sized packets, boiled pine cones, nut cake and extra virgin natural cedar oil in our shop. 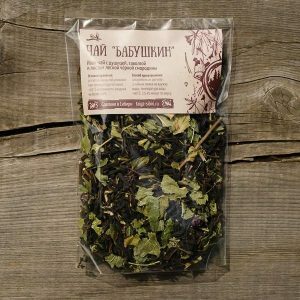 Remember ecologically clean forest teas when you consider what to bring from Siberia. They are an excellent present for men and women of any age. Teas establish health and allow to enjoy a real taste of a drink without any artificial flavors. 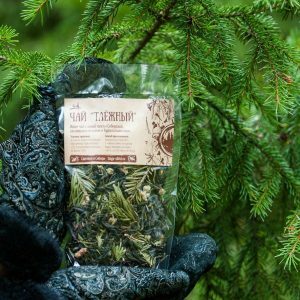 All flowers, berries and herbs are hand-picked in the cleanest areas of the Krasnoyarsk Region. 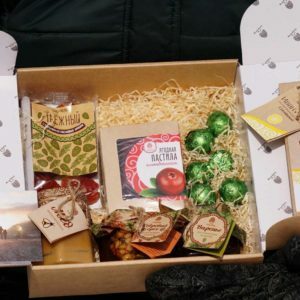 We can offer you high quality teas, tea mixes and whole degustation sets in stylish boxes – just choose, which of them your relatives will appreciate the most. 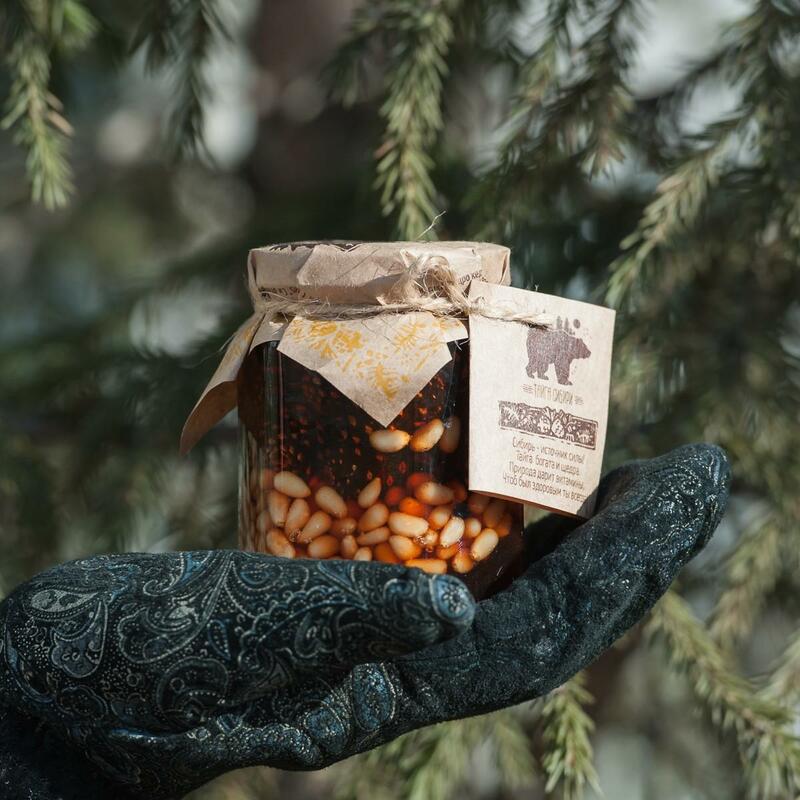 Unusual and very healthy pine cone jam gains more and more admirers. 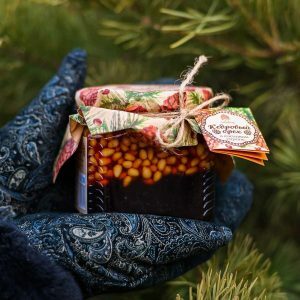 Its exotic and a little harsh taste, pronounced pine flavor and beautiful color makes this delicacy one of the most loved souvenirs brought by tourists from Krasnoyarsk. However, our shop offers not only young cedar nut or pine cone jam, but also sallow thorn, cowberry, blueberry, honeysuckle and fen berry jam. We also sell taiga honey and jars of delicious berry marmalade and bird cherry with sugar. Any of them will certainly delight the lovers of dainties! Meat eaters will appreciate chips and hunter’s sausages made of wild venison. Such food is filling and nutritional, suitable for fast and healthy snack without putting on weight. Spices impart piquancy to this product. High quality meat dainties sold in the “Taiga Shop” will become a cute present for a chief, a colleague or a friend. Your family members will hardly refuse to taste the real game too. Concentrated sbeetens produced by “Siberian Gifts” find a quick sale. They are made according to signature recipe allowing to save all benefits of natural honey, intensified with other curatives – berries, roots, propolis, healing herb extracts. 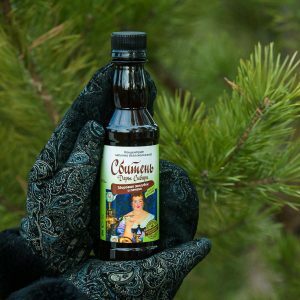 Our shop offers a great variety of sbeetens to establish health. The drinks are spilled in nice small bottles. Add only two spoons of the sbeeten to one cup of hot water and enjoy for a long time! 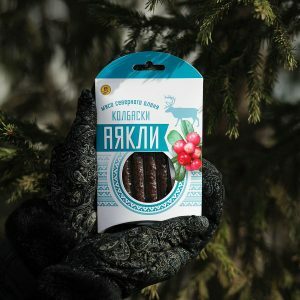 A general present with a twist is Siberian sweets. They are so original that even gourmands will be surprised. We offer sweets with bird cherry, berry, nut fillings, marzipan, halvah with nuts, marshmallow, marmalade, berry marmalade, frosted honeysuckle, chocolate covered strawberry and wild strawberry, dried pine cones on sticks, candied pine shoots and flowers… The sweets are sold by weight, in gift packages and sets. And finally a little bonus – our shop sells other souvenirs and presents in addition to tasty ones. Come and choose! We promise you will be satisfied! 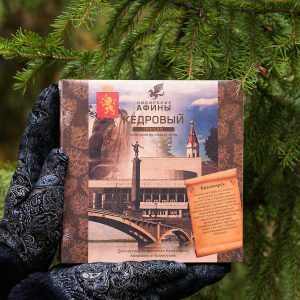 The shop of warm-hearted souvenirs “Siberian Taiga” is situated: 49B Shakhterov Street , “Strip Center” (“Torgovye Ryady”), shop № 6. Phone 8-903-920-5713. You can find a varied assortment of goods according to all tastes. We have natural taiga products, Siberian sweets and souvenirs, gift wrapping. Buy everything in one place and save time! Кедровые орешки понравились (жаренные). Лучше если чищенные. Не знаю сколько там чего полезного, но вот на вкус очень даже хороши. И цена — приемлимая.